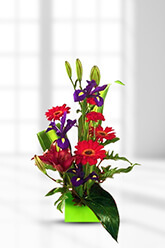 Playful, colourful and captivating are great words to describe this perky arrangement. Containing bright red Gerberas, Carnations, Asiatic Lilies and purple Iris you are sure to impress on the lucky person to receive this arrangement!Lilies may be sent closed/partially closed in order to prevent damage and to last longerFor a lasting impression, why not add a Box of Chocolates to your order? There are 3 chocolate options to choose from; Standard, Premium and Superior however, we recommend a Premium box to complement Jester. Delivered on time. Flowers were "beautiful" to quote recipient. Kays mum was very pleased with the lovely flowers for her 90 th birthday We have used your service several times. Very good.